Elvis & Me - The Priscilla Story will be presented by the Rhumbelow in Durban this month and in Pietermaritzburg in September. Back by popular demand, Elvis Presley tribute artist Doug Weich marks his sixth consecutive year at the Rhumbelow Theatre with his new show. It tells the story, seen through Priscilla’s eyes, about the relationship between Elvis and Priscilla from when they first met up until the day the music died with the passing of Elvis on August 16, 1977. It takes us on a journey through the different eras of Elvis and Priscilla, as we pay tribute to one of the greatest entertainers of all times, the King of Rock n’ Roll, and pay tribute to his Queen, the one and only true love of his life, Priscilla Presley. It was a fairytale love story that was filled with so much happiness but ended in so much heartache. A love and regret that was so strong that neither fame nor fortune could stop the downward spiral that would eventually lead to Elvis’ self-destruction. Weich is backed by his accomplished, multi-talented 8-piece band, MSG, featuring Wade Wight; Evan Cullum; Glen Turrell; Andy Turrell; David Knott; Kirsty Madgin; Nicky Knott and Sandi Da Cunha. A Rocktainment Production, this show is for audiences of all ages and not to be missed, with all-time favourites such as Whole Lot Of Loving, That’s Alright Mama, G.I. 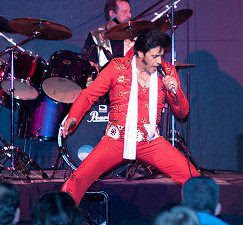 Blues, Blue Suede Shoes, Jailhouse Rock, Heartbreak Hotel, Johnny B. Goode and Suspicious Minds, just to name a few. Shows run at Rhumbelow Theatre in Umbilo from August 11 to 13 and from August 18 to 20 with performances on Fridays and Saturdays at 20h00 and on Sundays at 14h00. There is an extra performance on August 20 at 18h30. The venue opens 90 minutes before show for picnic dinner. Tickets R150 (R130 pensioners for the first week). Tables seat eight or more. Take along food picnic baskets. Braais will be available. There is limited secure parking and booking is essential. A cash bar is available (no alcohol may be brought on to the premises). Rhumbelow Durban is situated at 42 Cunningham Road off Bartle Road in Umbilo. “Elvis & Me - The Priscilla Story” will be presented in Pietermaritzburg at the Allan Wilson Shellhole on September 10 at 14h00 and 18h30.